The Dipladenia leaf start. Help! Well, now the start of the leaves. I am on tender-hooks all the way. I am hoping that as I am extra careful at each stage, that I will overcome this fear – whatever the fear or blockage is. The first whole leaf actually took a whole day and I will let you be the judge as to its success or not. The result is still not as I am wanting it and I can’t even define what it is I want. I am very much a detail person, and it may be that I am concentrating too much on this without thinking enough of the overall result. This is a picture of the start of the leaf. 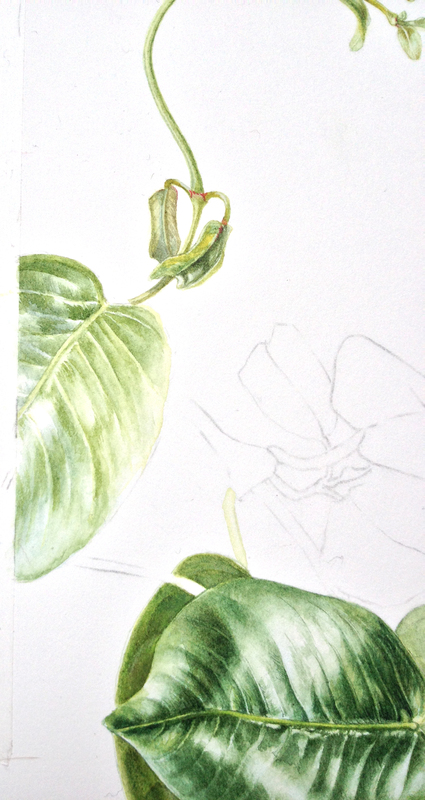 A leaf or two in progress. My fingers, toes and everything else are crossed. Spot the mistake leading to a near miss! I know that feeling, of walking a tightrope, thinking that one wobble will lead to disaster! However, I can’t see where you think the problem is! I see a leaf that has lovely tones that are building up a 3D shiny leaf, with complex colouring. I would love to know more of your thoughts about how this work is going. Hei Anne, thank you for your nice comments. I wish I could explain how I feel. When I start off the leaf I feel it goes well and then as I continue working my plans seem to disintegrate. 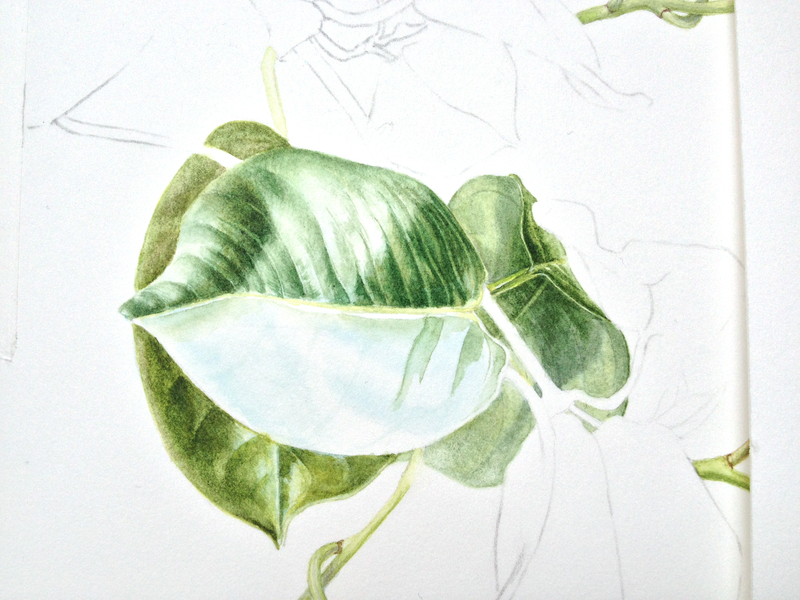 However, today I was at a wildlife art exhibition and when I came home I started another leaf. It isn’t even 1/4 finished, but I had a better feeling with it. Hopefully, tomorrow that will continue. But you will hopefully see the result in a few days time. Wow I know that feeling too! Each day I am anxious as I start, afraid to make the first mark. Once I’m in the groove it goes away then I don’t want to stop. I think you have a lovely beginning! Cant wait to see the progress. Hei Susan, funnily enough it isn’t being afraid to make the first mark – luckily enough, so far I haven’t really had that problem. But I suppose that on this painting I just haven’t got into that comfortable groove. But thank you for your lovely comment. It helps.